To offer our customers as complete a range as possible, Trip & Co also provide security products. The following products can be delivered to you directly from stock: aircraft wheel chocks, safety coats and suits, ear defenders, traffic cones and director lights. Trip & Co also supplies several traffic cones. 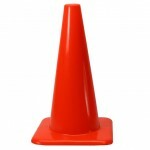 Traffic cones are designed to be highly visible and easily movable. Various sizes are used, commonly ranging from around 30 cm (11.8 in) to a little over 1 m (39.4 in). Traffic cones come in many different colors, with orange, yellow, pink, and red being the most common colors due to their brightness. Others come in green and blue, and may also have a retroreflective strip (commonly known as "flash tape") to increase their visibility. In co-operation with a Dutch airline, we specially designed and developed a pair of shock absorbing aircraft wheel chocks, made of a special rubber compound which guarantees, under extreme circumstances, maximum grip on tarmac and concrete, this due to the ribbed surface.